Last year for Christmas, I put together this little gratitude jar for my family. I had seen the idea on the internet and thought that it was right up our alley. I basically just cleaned out a mason jar, attached some string and a little label that says 'Gratitude Jar,' and filled a little bag with tons of little pieces of colourful paper that I had cut. 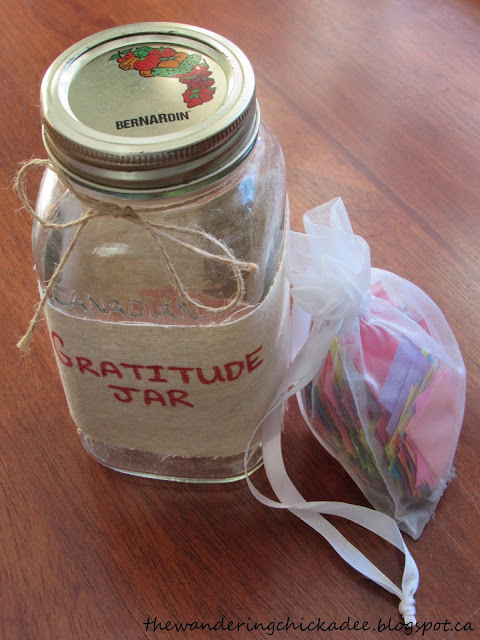 The whole point of a gratitude jar is to write down the things that you are grateful for on the little pieces of paper and stick them in the jar. At the end of the year, you can empty the jar and look through everything that you or your family was grateful for that year. In 2015, we used the gratitude jar a little bit but we never filled it up. We kind of forgot about it but I really want to use it this year since I feel like I need it to help remind me of all of the good things in my life.